Alcohol effects on the body may actually be beneficial in terms of longevity. Alcohol prevents the conversion of methyl alcohol to formaldehyde. Aspartame effects may also be suppressed by alcohol for this reason. Some time ago it was reported in the popular press that scientific studies indicated light to moderate consumption of alcohol was associated with a decrease in mortality from chronic diseases. In other words, drinkers lived longer than non-drinkers. How could this be? Doesn't this fly in the face of everything we thought we knew about what constitutes a healthy lifestyle? Well, the answer is yes.....and NO! There is NO doubt that heavy drinking is just plain unhealthy! Alcohol effects on the body CAN cause many problems. However statistically alcohol consumption in moderation seems to have a beneficial effect on longevity. Moderate drinking is considered to be 1 drink per day for an adult.It should be noted that according to the Harvard School of Public Health,women who consume two or more drinks a day increase their risk of breast cancer by more than 40 percent! A theory has emerged that I first read about on Dr. Joseph Mercola's website. It involves both methyl alcohol and formaldehyde which is another toxin. The chemistry is a bit complex, but I will try to keep it simple. 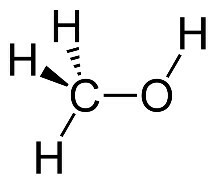 The Hypothesis: Formaldehyde produced from dietary and environmental methanol metabolized in situ at the non-hepatic sites of class I alcohol dehydrogenase (ADH I) may play a role in many diseases of civilization (DOC). Ethanol may in turn act as a competitive inhibitor of methanol’s conversion to formaldehyde by ADH I, as reflected in the U-shaped curve of alcohol consumption. Methyl alcohol (also called methanol or wood alcohol) is a toxin you get in the diet. You get tiny amounts of methanol in fresh fruits and vegetable, from aspartame (Nutrasweet), and your body actually makes tiny amounts of it through the fermentation process in your stomach. The methanol in fruits and vegetables is bound to something called pectin, and since your body can't break pectin down, the methanol passes harmlessly out of your body. However when fruits and vegetables or their juices are canned or bottled, the methanol separates from the pectin, and can then be converted to formaldehyde which is a carcinogen (cancer causing substance). According to the theory about alcohol effects on the body put forth by the scientist W.C. Monte, alcohol (which is ethanol) is broken down first in the liver before methyl alcohol. In the time it takes for the body to break down the ethanol, the methyl-alcohol does not get a chance to be metabolized into formaldehyde, and so passes harmlessly out of the body. Heavy drinking on the other hand causes the activation of the P450 hepatic microsomal ethanol-oxidizing system, which is able to metabolize large amounts of ethanol, also allowing the methyl-alcohol to be metabolized into formaldehyde. This is why light to moderate alcohol consumption appears statistically beneficial, but heavy alcohol consumption is not. The key is that the P450 system NOT be activated. Small amounts of alcohol below the threshold that activates the P450 system appear to offer this benefit. Aspartame effects are likely related to it's content of methyl alcohol(about 11%) which converts to formaldehyde in the brain. Alcohol effects on the body which can be beneficial should not be used to encourage people to drink, but they should be a reminder to you that heavy drinking works against you. If you consume alcohol, moderation is the key.